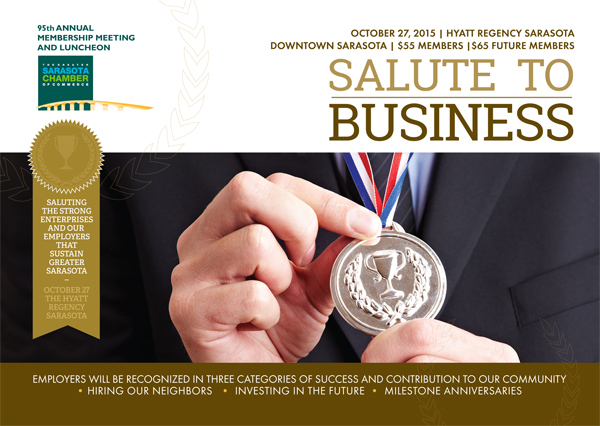 The Greater Sarasota Chamber of Commerce will recognize the achievement of our members at the 4th Annual Salute to Business at the 95th Annual Meeting on Tuesday, October 27. The Salute to Business program recognizes members who have hired our neighbors, invested in the future and reached a milestone anniversary of local service to our area. This summer, Chamber members shared positive information about their business based on the three categories. Findings indicate that there are dozens of Chamber members that will qualify for recognition in each of the three award categories. The top three honorees in each category were identified and will be recognized at the luncheon for their achievement and contributions to our community. Other highlights of the program will be the passing of the gavel from Board Chair Chris Gallagher, Hoyt Architects, to the new Chair and current Chair-Elect Lisa Krouse, FCCI Insurance Group. The Chamber will also recognize an outstanding member with the Chair’s Cup Award, sponsored by Kerkering, Barberio & Co. The event is presented by Shumaker, Loop and Kendrick, LLP. Sponsorships are still available as well as gold and silver tables. To reserve your tables or find out more information about sponsorships please contact Brittany Lamont at blamont@sarasotachamber.com or visit our website. Next Post Non nobis solum nati samus. Not for ourselves alone are we born.